Actress Fiona Shaw is performing Samuel Taylor Coleridge’s epic poem The Rime of the Ancient Mariner at the Old Vic Tunnels with dancer Daniel Hay-Gordon. The production is directed by Phyllida Lloyd (Mama Mia, The Iron Lady) with choreography by Kim Brandstrup. Coleridge’s eerie ballad of horror and redemption, written in 1798, tells the story of a sailor who suffers a terrible curse after killing an albatross at sea, and is condemned to relive the experience by recounting it to a stranger. Until 13 January at the Old Vic Tunnels, near Waterloo Station. Phyllida Lloyd’s production showcases the “strength, clarity, musicality, physicality and emotional commitment” of Fiona Shaw, says Donald Hutera in The Times. Shaw is not just telling the mariner’s tale, she lives it “with an incandescent intensity that approaches the heroic”. This is a poetry recital with a difference, says Sarah Hemming in the Financial Times. Shaw is a compelling performer who buttonholes your attention with her evident relish for the text. It’s “a riveting, virtuoso performance”, at its eeriest and most powerful with just “a couple of props and the human voice to bring Coleridge’s poem alive”. Personally, I find this interesting because, Phyllida Loyd, that’s quite a name! Maybe Mr Coleridge might get some cinematic treatment as well, sooner or later? 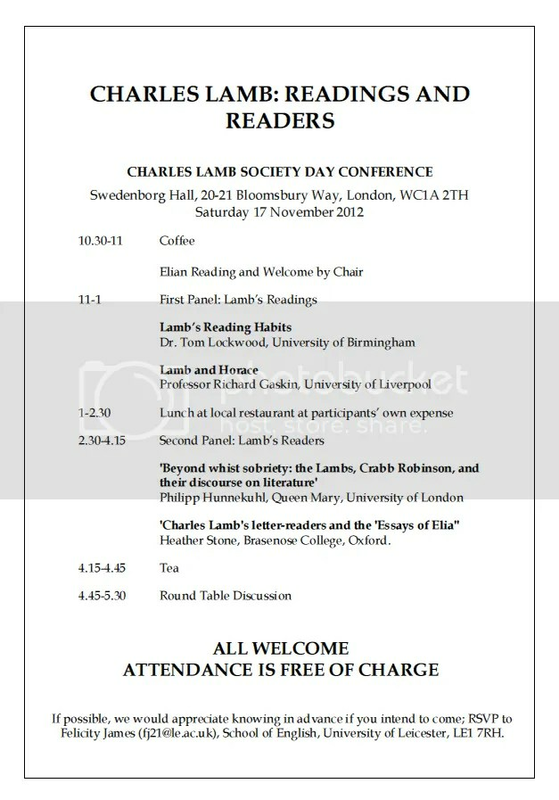 Announcement for the “Charles Lamb Society Day Conference”; if I was in London, I would attend. The conference is, among other things, notable to people interested in Coleridge because of the assistance of Mr Hunnekuhl, who wrote a very intriguing master thesis about Coleridge’s and Wordsworth’s visits to Germany under the title Imagination and Growth for the University of Edinborough back in 2007, and was so generous as to make the document publicly available, at least for some time.